I, as part of a team with Dr. Shaowen Bardzell and Dr. Jeffrey Bardzell, created this design as part of the Intel Science and Technology Center (ISTC) for Social Computing with the goal of encouraging discussions surrounding the ideas of self-tracking through technology and surveillance. Specifically, this design focuses on stress. The Fractured View is a camera that when squeezed, captures an image that is distorted based on the strength and duration of the squeezing. 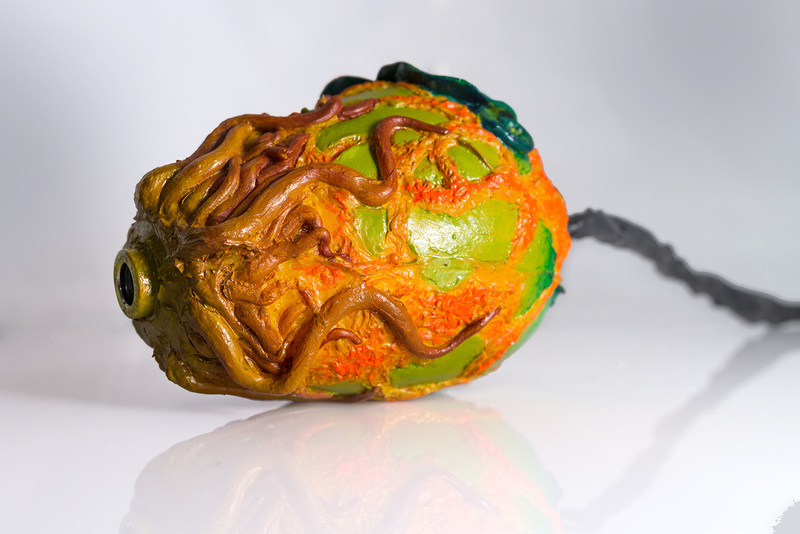 The design is presented as a kind of stress ball that creates beautiful or exploded images when it is squeezed. The form of the FV is less of a reference to trends of industrial design, but has a more metaphoric relationship with its functioning. 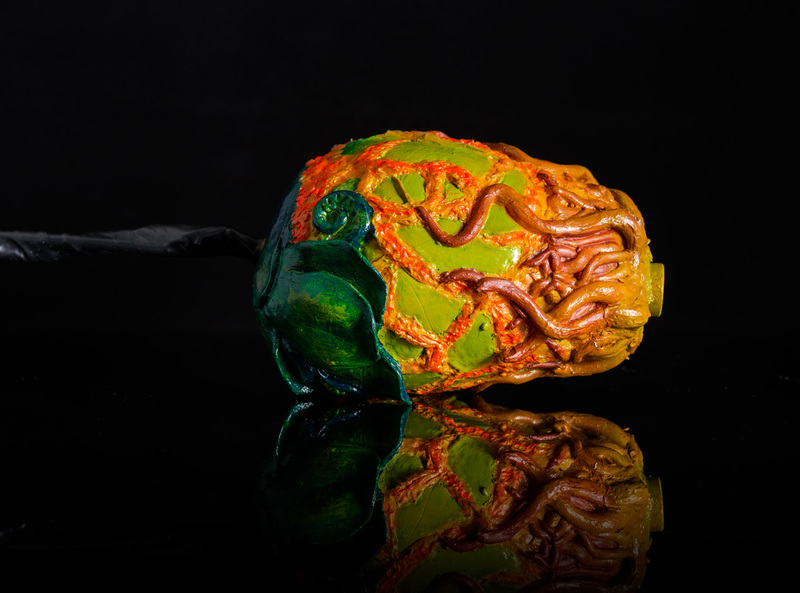 Given that the design “explodes” images, an organic, plant-based form was chosen to represent duality – cracks in the surface represent either the internal destruction of the plant, or the bursting forth of a pod to disseminate seeds of new life. The outer shell of the Fractured View was first molded in clay, similar to the Melody Bot, and then used to create a plaster slip mold. 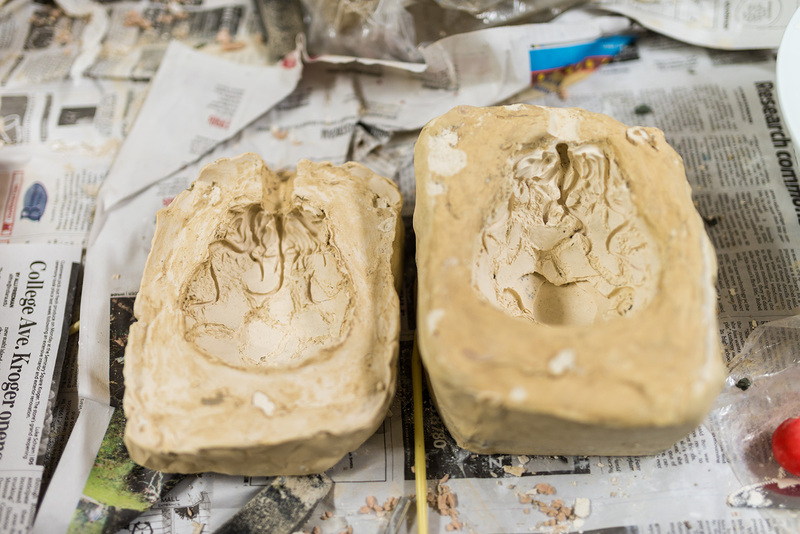 These molds were used to create hollow, liquid latex shells for the rest of the Fractured View’s components. Initially, a flex sensor controlled the Fractured Views sensing, but the ways that it was squeezed frequently led to deformation and malfunction. 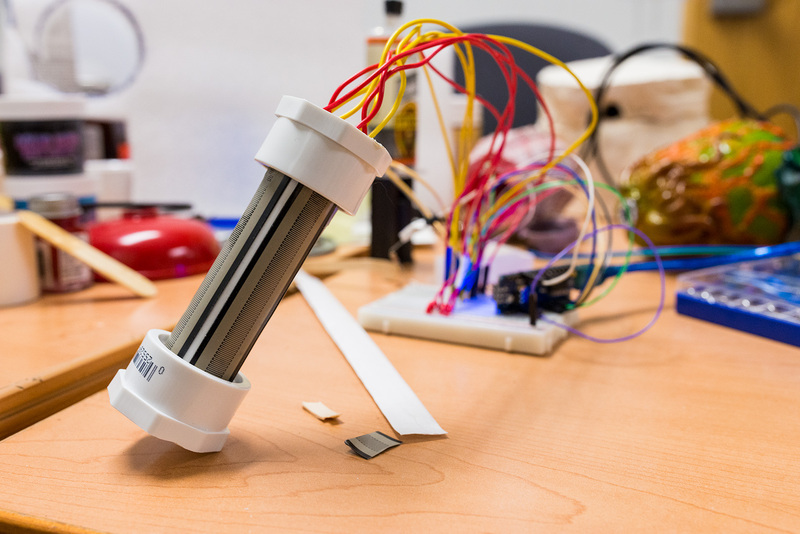 Iterating on this idea, a cylindrical core of force sensitive resistors was created, sensing pressure in eight different directions. This force sensitive core was surrounded by an air gap to reduce constant pressure and then pillow stuffing to give the device a soft, squeezable feel. The readings from the physical device were captured by an Arduino Nano board that translated all of the readings from the sensors into an overall “squeeze” rating. This was then sent to a Processing program that would wait until the squeeze rating reached a sufficiently high level, and then fire the camera in the design, capturing an image. Readings from the force sensors would be summed until the overall squeezing reduced, at which point the some of force readings and the duration of the squeezing would be multiplied and then fed into a modified version of Daniel Shiffman's Explode, creating an image that is exploded based on how long and with how much pressure the design was squeezed.